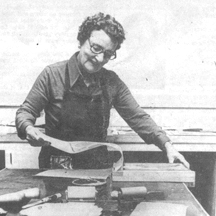 In 1979, Lillie Kleven established the “Lillie M. Kleven Graphic Arts Fund” by donating $1000.00. The interest from the fund was to be used specifically for the purchase of original prints, including some student purchase awards, to establish a departmental “teaching collection.” Each year since then Ms. Kleven has donated both additional funds and original prints to the collection. Lillie M. Kleven graduated from BSU in 1937 with an education degree and later received a master’s degree in library and information science from George Peabody College in Nashville, Tenn. From there, she oversaw the reference department and readers service at the University of New Hampshire from 1941-42 after which she spent three years in the U.S. Navy Reserves. After World War II concluded, she helped establish American Cultural Centers throughout Japan from 1946-49. There, she became interested in Japanese printmaking and began collecting wood-block prints. 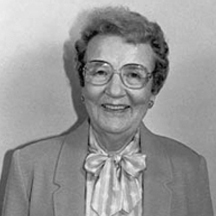 She returned to the United States in 1950 to serve as a cultural affairs office for the U.S. Information Agency in Washington, D.C., where she oversaw the Far East Branch of the agency’s Information Center Service. She retired from government service after 30 years in 1972 and moved to Rossmoor Walnut Creek in California. Kleven established the Lillie M. Kleven Print Collection at Bemidji State in 1979, a collection which now totals several hundred pieces. New additions are made to the collection annually. The Kleven Collection is exhibited regularly in the Talley Gallery with selected prints loaned to other public areas on campus and in the community. Portions of the collection are sometimes exhibited in Bemidji State University’s Talley Gallery and Bemidji State’s Harlow|Kleven gallery at the Watermark Art Center in Bemidji. When the Harlow|Kleven gallery opened to the public at a Dec. 2, 2017 dedication ceremony, visitors explored portions of BSU’s Margaret A. Harlow Ceramic Teaching Collection and Lille M. Kleven Print Collection.